Create fond Christmas memories by attending a holiday concert, play, ballet, or musical performance in the Minneapolis area. Choose from tried and true holiday classics like "The Nutcracker," the "Messiah," or "A Christmas Carol," or pick something unique like an original production from the Hennepin Theater District. Some of the Minneapolis-St. Paul performances are free, but if they offer tickets for purchase, do so early because they often sell out fast. 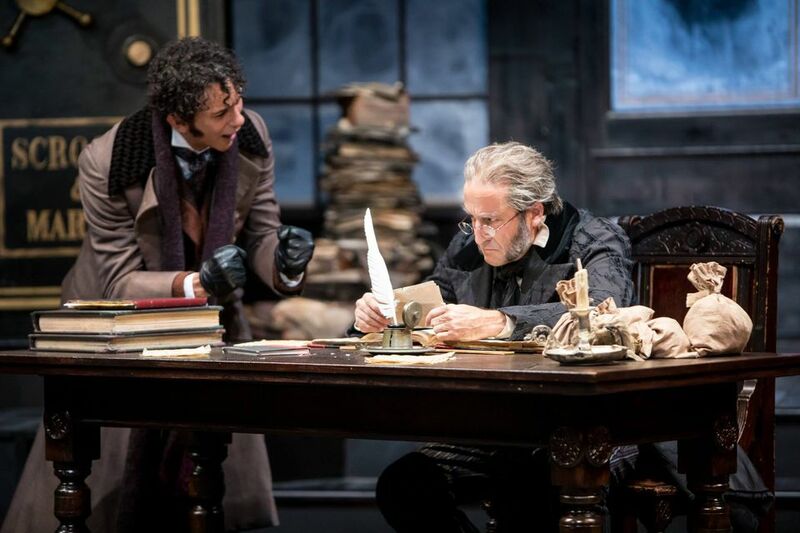 Guthrie Theater: "A Christmas Carol"
The traditional Twin Cities' holiday production of Dickens' "A Christmas Carol" plays at the Guthrie Theater each November and December. Although it's been performing this holiday show for decades, the Guthrie makes it fresh and full of wonder every year. No children under 5 admitted. This may be the classic of all classics for the holidays. The Metropolitan Ballet and Hopkins Youth Ballet annually perform three performances of Tchaikovsky's "The Nutcracker" with a full symphony orchestra at the Hopkins Auditorium in mid-December. The Ordway in St. Paul annually presents a magical holiday production or two for kids and adults alike. On November 17 - 18, 2018 enjoy a performance of Dolly Parton’s Smoky Mountain Christmas Carol. A live acoustic band brings Parton’s original score to life in this “concert style” presentation of a heartwarming, musical re-imagining of a holiday classic. On November 20 - 2, 2018 the whole family will enjoy The Hip Hop Nutcracker with guest MC Kurtis Blow. And on December 5 - 30, 2018 enjoy performances of Elf the Musical. 2018's holiday show for children is "A Charlie Brown Christmas" and plays on dates from November 30 through December 22, 2018. There are special "pay as you're able," "Grandparent Day," and ASL- interpreted performances scheduled. Discover the true meaning of Christmas and the place where you belong with Charlie Brown, Snoopy, and the whole Peanuts gang. The Minnesota Boychoir performs winter holiday concerts annually in December and January at various venues in Minneapolis and St. Paul, and residents of the Twin Cities love it. Venues include the Basilica of St. Mary in Minneapolis and Landmark Center in St. Paul. All shows are free, but a donation is requested. This year the annual winter concerts feature a variety of sacred and secular classics. Seasonal favorites include Night of Silence and a jazzy rendition of Santa Claus is Comin’ to Town. The first Winter Concert is at Ted Mann Concert Hall on Sunday, December 16 at 7:00 p.m. The Hennepin Theatre District presents all kinds of holiday entertainment in several restored historic theaters. Events can range from a performance of "Swan Lake" by a renowned Russian ballet company to plays, concerts, choral music, and holiday shows with local stars. This year enjoy Brian Wilson presents The Christmas Album Live with special guests Al Jardine & Blondie Chaplin on Wednesday, November 28 at 8:00 p.m. You'll remember Brian Wilson of Beach Boys fame. The New Standards, Mannheim Steamroller, The Blenders, and Melissa Etheridge are also on the calendar for 2018 holiday shows. The Twin Cities Gay Men's Chorus presents an annual holiday show featuring the chorus, small ensembles, and special guests. The holiday "spectacular" takes place at the Ted Mann Concert Hall in Minneapolis over a three-day weekend in early December. Minnesota always brings a fun and entertaining group to perform for the holidays at the Fitzgerald Theater, including The Steeles family for a concert of sacred and secular holiday music. This 1,000-seat venue acts as Minnesota Public Radio's largest broadcast studio. The Actors Theater of Minnesota presents two holiday shows every December at the Camp Bar and Cabaret at Camp in St. Paul. This year they will present A Hunting Shack Christmas, an original play by local playwright Jessica Lind Peterson. "On the eve of his 10th wedding anniversary, Charlie heads up north to his hunting shack to reassess his life. To his surprise, he arrives to find his shack occupied by his estranged uncle, Big Paul, Pauls girlfriend June, and Junes grown son, Ham. An ill-timed snowstorm leaves the whole group stuck together to try to settle their differences and enjoy Christmas. A rollicking holiday comedy." Holiday concerts at Twin Cities colleges are produced and performed by students, faculty, and staff. Most take place in the first week of December, and purchasing tickets in advance is recommended. Several performances are free. Augsburg College celebrates the season with the Advent Vespers tradition of hymns, anthems, and carols. Other colleges with Christmas concerts include Concordia College and Bethel University. The choral group VocalEssence has been performing its annual holiday concert every December for four decades. The group performs at churches in Apple Valley, Plymouth, Minneapolis, Edina, and Stillwater. The Welcome Christmas performance is a 45-minute concert featuring favorite carols, and the whole family is expected to clap, wiggle, and sing along. Children age 3 and under are free. This year they also present "world premieres by screen and stage composer Nico Muhly (hot off his premiere at the Metropolitan Opera in New York!) and two new carols by winners of the 21st annual Welcome Christmas Carol Contest." The Minnesota Opera typically presents a holiday performance of some kind, such as the original opera Silent Night - A Moment of Peace in the Midst of War. The Minnesota Orchestra annually celebrates Christmas with joyous concerts every December. Buy tickets early while a good selection of seats is available. Concerts include "Home for the Holidays," and Latin, jazz, and gospel caroling classics.